Simon Says Stamp and Show: Simon Says Stamp and Show Some Bling! Simon Says Stamp and Show Some Bling! 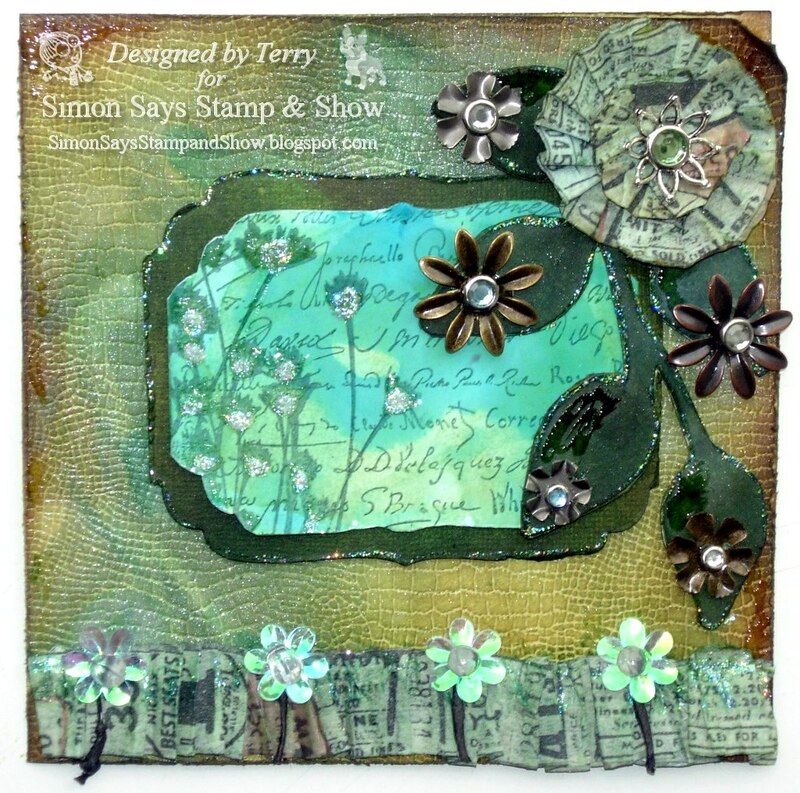 Terry made a card with lots of Bling....she saw the flower in a Craft Magazine and tried to make a flower with the Tim Holtz Tissue Tape in her own way. 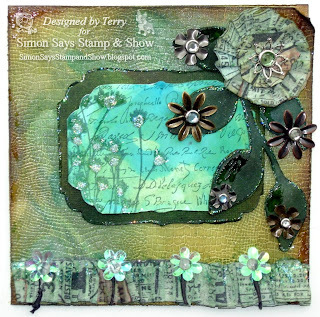 She coloured her card with lots of Distress inks such as Forest Moss, Vintage Photo, Bundled Sage and Pine Needles, used lots of Crackle Accents and Tim Holtz Idea-ology Foliage Advantus.The flower is placed on the Art Parts Leaves from Wendy Vecchi. The middle image was made with Adirondack Alcohol Inks and mixed with Blending Solution. 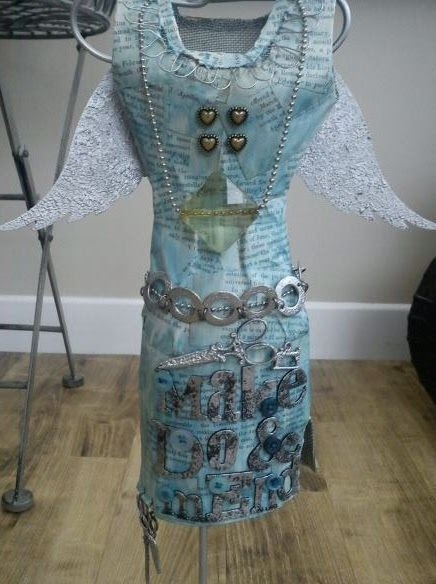 Tracy decided to pull out all the stops for her first DT piece recycling a wired dress form that was damaged, giving Tracy the idea of a MAKE DO AND MEND piece which has been covered in torn paper from an old book and coloured using Broken China Distress Stain. Grunge Blocks have been added to give dimension to the lettering and lots of Claudine Hellmuth Matte Multi-Medium. Most of Tracy's metal finds for this piece were coloured with Silver Adirondack Paint Dabber which adds great texture to the wings and metal embellishments. 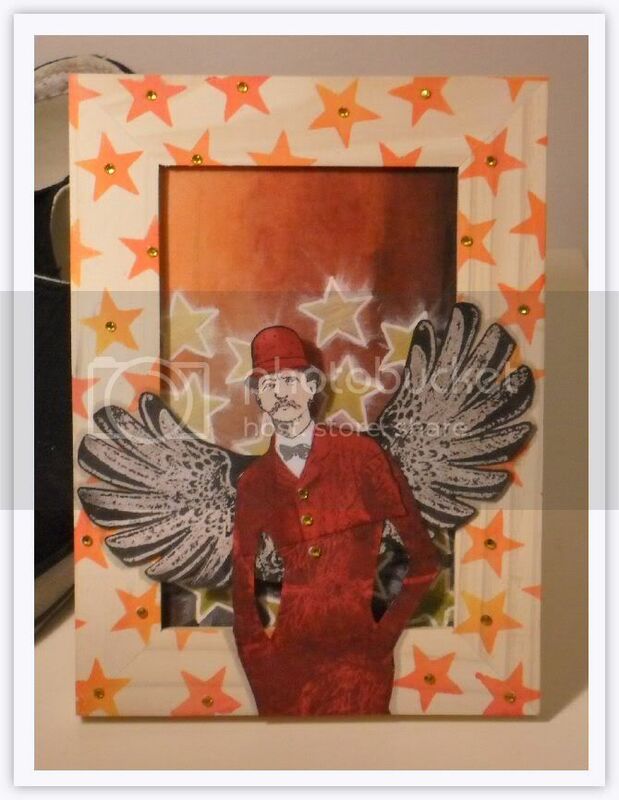 Candy's vintage "bling" creation combines lots of techniques and textures with shiny metals, fluffy feathers and crystals to accentuate a lovely vintage "tin type" cabinet card. There are lots of Tim Holtz elements in this piece including the background paper from Lost and Found Paper Stash, Vintage Cabinet Card, Mini Cabinet Card and Tattered Florals die cuts, Ideaology Corners and Trimmings. Juniper and Pitch Black Paint Dabbers are the perfect tools to antique the metals for a real vintage appearance. Ellen was so excited to share her first DT project! She started with an 8 x 10 canvas board and went to town with paint dabbers, blending several colors together. Then used a harlequin stencil with gesso and perfect pearl mists, Tim's bitty grunge stamps in black and white, more gesso accents, loads of idea-ology and a subtle touch of *bling* to add just the right amount of sparkle! 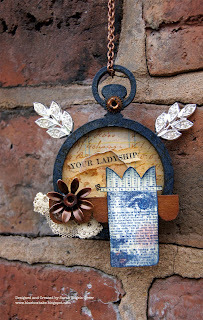 To begin Lynne's Bling~0~licious project, she chose Wendy Vecchi's Timely Pocket Watches and the layers began. The first layer consisted of Gold Mettalic Paint, while still wet she sprinkled on a bit of Vintage Glitter Glass. When dry she painted on a layer of Rock Candy Crackle Paint. The watch was finished off with a layer of Jet Black Archival Ink. Additional bling consists of Vintage Trinkets and Rusty Hinge Distress Stickles. It's no secret that Nancy loves to decorate mini-books. This one began with chipboard and extra large tags wallpapered with Pink Paislee's Butterfly Garden. The cover showcases Prima's bling swirls which were cut to look as if it is the bird's flying pattern. Visit Nancy's blog to see the inside pages. Bling isn't usually Dan's style and he's surprised to admit that this project looks better with the added bling than it did before he added it! 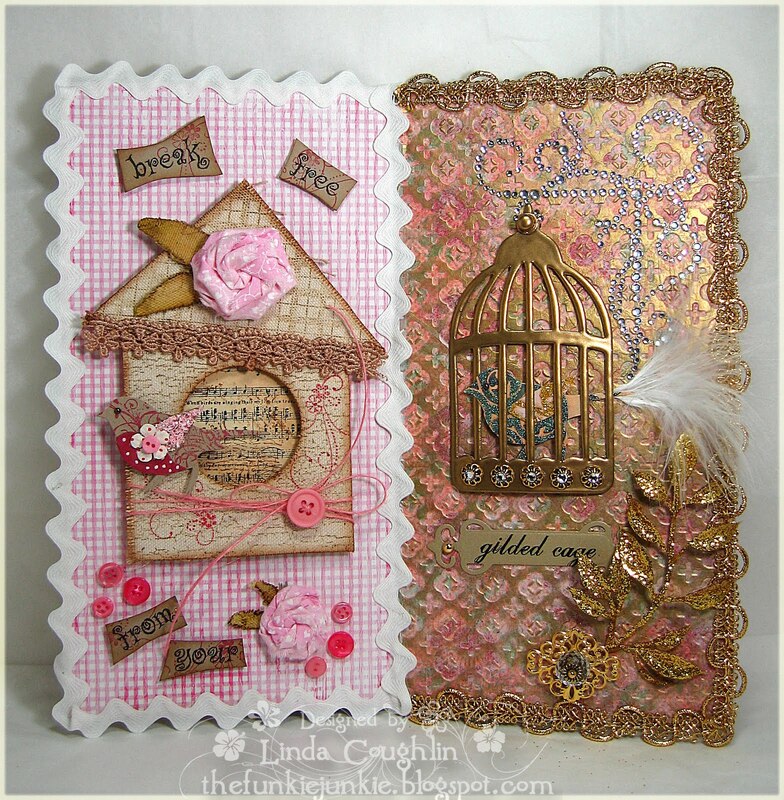 Products used include Claudine Hellmuth Studio Paints, Distress Stains in the new colours of Picket Fence, Dried Marigold and Aged Mahogany, the Royal Script and Steampunk stamp sets and some adhesive backed gems. Are we sometimes a prisoner of our blingy lifestyle? Linda chose to explore that question with her project this week. 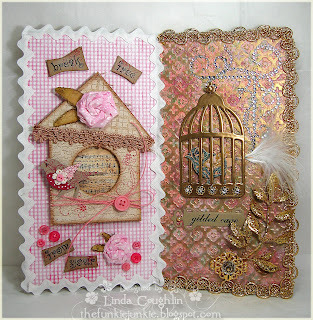 On the bling side, she created "silk" wallpaper with a Cuttlebug embossing folder and Encore metallic gold ink and gold embossed the bird cage that was cut with the Tim Holtz Caged Bird die. A crystal flourish from Prima adds extra sparkle. Her bird flies free on the "simple life" side with pretty gingham wallpaper that was brushed with a mix of gesso and snow cap acrylic paint. Lots of Vintage Photo distress ink was used to give that side a rustic, homespun feel. It's not often that Sarah does bling, but a pair of beautiful vintage earrings inspired the wings for her flying Diva. Sarah used Wendy Vecchi Art Parts and Art Fit for a Queen stamps, Stormy Sky, an Idea-ology flower along with vintage lace, metal findings and page scraps to create her piece. I started with a fat mini canvas and turned it into a kind of chunky ATC. I used Wendy Vecchi and Tim Holtz stamps, Fired Brick Distress Ink ... some Grunge Paper and some of Claudine Hellmuth's Stick Backed Canvas ... Multi Matt Medium to stick and then I added Sticky Backed Pearls for my bling. ﻿Please stop by The Design Team's individual blogs for more detailed pictures and further information on their work...Just click on their names! We are looking forward to seeing your interpretation of this theme! Our wonderful site sponsor Simon Says Stamp is once again giving away a $50 gift voucher! The prize will go to a random entry chosen by Random Generator. The challenge will close at Midnight Eastern time on Sunday 14th August 2011 and the winner will be announced during the following week. 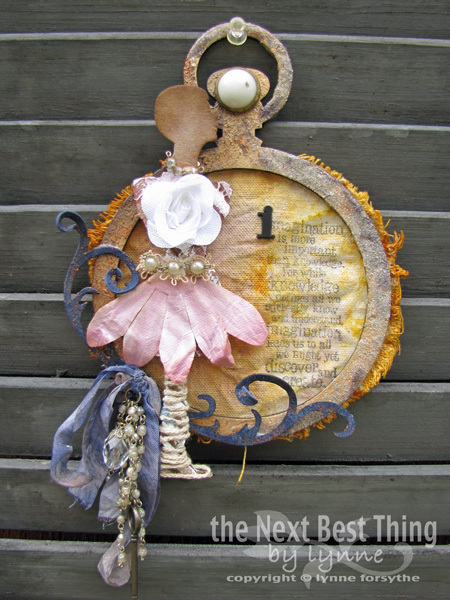 To qualify all you need to do is create a new piece of work ... post it on your blog ... with a link to this site and then pop a link below so everyone can come see what you made! Bling, now we're talking, off to scratch in my stash! Inspirational work from the DT as always. Great review, I love your site. Wonderful creations by DT and very inspirational. Thanks! Gorgeous DT work Girls. Love Bling!! Great projects ladies, I LOVE bling! Thanks for a great challenge. Stickles was my bling of choice! Hope that is ok! Beautiful DT inspiration as always! Beautiful creations by the DT. Thanks for the great BLING challenge......every girls FAVorite! Thanks for the challenge and for the lovely and varied inspiration pieces. thanks for the challenge - every card needs a little bling! Wow, loved it all! I'm an old hand at jumping through the DT blogs. I start with Nancy Wethington, my local design heroine and then hop through every blog. Always great for inspiration AND a bad mood! Terry, Dawny P and Linda E had treasures. Thanks for the fun. Welcome To Ellen and Tracy! Simon Says Stamp and Show a Tim Holtz Technique. Simon Says Stamp and Show a Tag!